I think it’s more accurate to see your thesis submission as the summit. The viva comes a little later. The viva is talking about the climb, how you did it, what worked, what didn’t and maybe how it compares to other climbs. While you’re up at the summit though, pause, look around. What’s on the other side of your PhD-mountain? Where are you going to go next? The Podcast is 2 and my Ebook is 99p! Viva Survivors Podcast turns 2! Two things happened last Friday – the podcast turned two (Happy Birthday Viva Survivors Podcast!) – and the Twitter account for the podcast picked up its 1000th follower, which is kind of neat. So… What to do to celebrate this? A special edition of the podcast where I invite everyone back to give updates? I wish I’d thought of that sooner. A series of Google Hangouts where I look at various parts of the viva or preparation process? Not yet, but I’m thinking about that for August (message me if you’re interested!). A bottle of champagne? A cup of tea? How about… Until midnight on Friday I drop the price of Fail Your Viva to 99p (and $2.99 in the US)? Thanks for coming and listening to the podcast over the last few years, for all your help in helping me to share the stories of PhD graduates – and more recently for all your help with my research into the UK PhD viva experience. The results of that will come out over the summer, and I’ll keep looking for an appropriate way to present things as I compile the results. Many, many thanks to the Viva Survivors who have shared their stories for the podcast – you can see all of their names on the Archive page. They’re awesome and amazing for giving their time and being so willing to help others in this way. Thanks guys. Until next time, thanks for reading – and thank you again for all of your support over the last two years. In this episode I’m talking to Dr George Julian, who completed a PhD in the Psychology of Special Education in 2003 at Cardiff University. George is the creator of VivaCards, a great little innovation in viva prep. As well as talking about her PhD and viva, we also had a chat about where these cards came from, how they might be used and what the reaction to them has been like. I bought myself a set last month and think they’re really cool: they’re great for either self-directed preparation or for helping others to ask you helpful questions. If you’ve got any comments or questions about this or any episode, please get in touch! You can leave comments on all of the episode posts, drop me an email or tweet. I’m always looking for more people who would like to share their experiences – it would be great to hear from you. No, that’s not a mistake in the title! For this episode I asked my good friend Dr David McGrogan (who you might remember from Episode 16) to interview me about my PhD and viva. 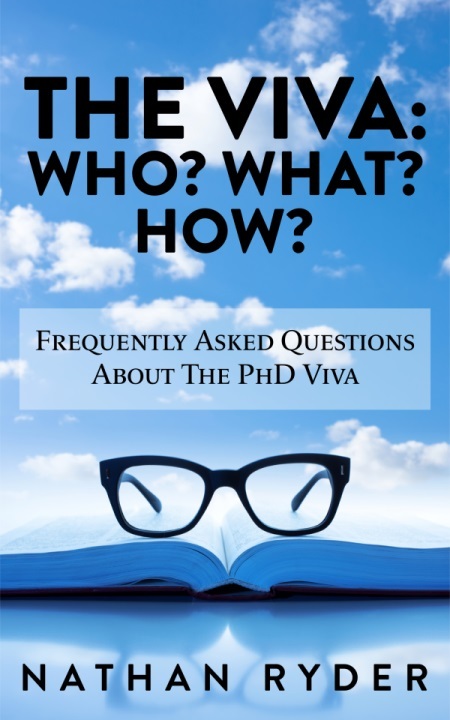 I’ve mentioned bits and pieces about my doctoral experiences over the previous twenty-four episodes, but thought it might be interesting to talk about the viva as a whole. In the autumn it will be ten years since I started my PhD at the University of Liverpool, and so it seemed like a good sort of time to look back and reflect. I hope you find it interesting! Just in case you don’t know, when I’m not doing the podcast I work freelance as a skills trainer in Higher Education, working primarily with postgraduate researchers all over the UK (and soon, the world!). In the last few years I’ve met close to a thousand PGRs on a workshop that I deliver called Viva Survivor, which was the inspiration for this podcast. In turn, that workshop inspired me to write Fail Your Viva, a book about viva preparation (despite the title!). So that’s what I do in a nutshell! If you have any questions or comments about this or any other episode then please get in touch: comment on a post, email me or tweet away!